The Mailbox trail is located in the Plateau Division of the Uncompahgre National Forest near Grand Junction, Colorado. 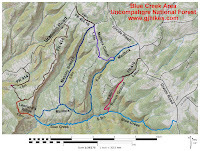 The trail begins off of Divide Road where it descends a branch of the Blue Creek drainage for almost 5 miles before coming to an end in a grove of cottonwoods at a 3-way junction with the Blue Creek and Leonard's Ridge trails. Mailbox is a double track trail that is open to ATV's that are 50 inches or less in width as well as dirt bikes, horseback riders, mountain bikers and hikers. To get to the trailhead drive west for 14.2 miles on Highway 141 from its junction with Highway 50 near Whitewater, Colorado. Turn left onto Divide Road and continue for another 19.6 miles, crossing a cattleguard at the forest boundary after about 6 miles and passing the turnoff for the Uranium Road just before 15 miles. Look for the 619 marker on the right hand, or west, side of the road. According to the marker TR #619 is closed to vehicles so we parked and began from here. From Divide Road the trail crosses some open rolling meadows and after about 3/4 of a mile comes to a trailhead sign for the Mailbox trail. There is a trail squeeze at this point that limits further travel to ATV's that are 50" wide or less. The trail begins a gentle descent down a shallow draw. Before going very far it is connected to on the right by the Mailbox Cutoff trail which begins off of Road 404.1B, about a mile and a half away, at the point where the Massey Branch trail begins. As the trail continues the shallow draw turns into a widening gulch. The upper portions are a little steeper and rocky in places. A small stream seems to come and go as though it is flowing underground in places. Stands of quaking aspen trees, with grass and ferns at their feet, line the trail as it heads down the Mailbox branch of the Blue Creek drainage. After heading down the drainage for a couple of miles the trail begins a little climb that takes it around the point of the cliff that has bordered it on the west up to now. Near the 4 mile point the Mailbox trail reaches the Blue Creek Park area and is connected to on the right by the lower end of the Massey Branch trail. The Massey Branch trail is open to dirt bikes, mountain bikes, horseback riders and hikers. Just past the Massey Branch junction there is a stock pond on the left side of the trail. When we passed by the pond there was a swarm of deer flies that decided to become our very best friends for the next quarter mile or so. It was like they were laying in wait near the water for something to feed on. Deer flies and a few other types of biting flies are about the only real pests on the Uncompahgre Plateau in most places. Mosquitoes are actually scarce in the area. After passing the stock pond the trail begins its final descent. The descent is gradual at first but the last quarter mile gets quite a bit steeper. The Mailbox trail comes to an end after crossing a seasonal stream and entering a clearing surrounded by cottonwood trees. 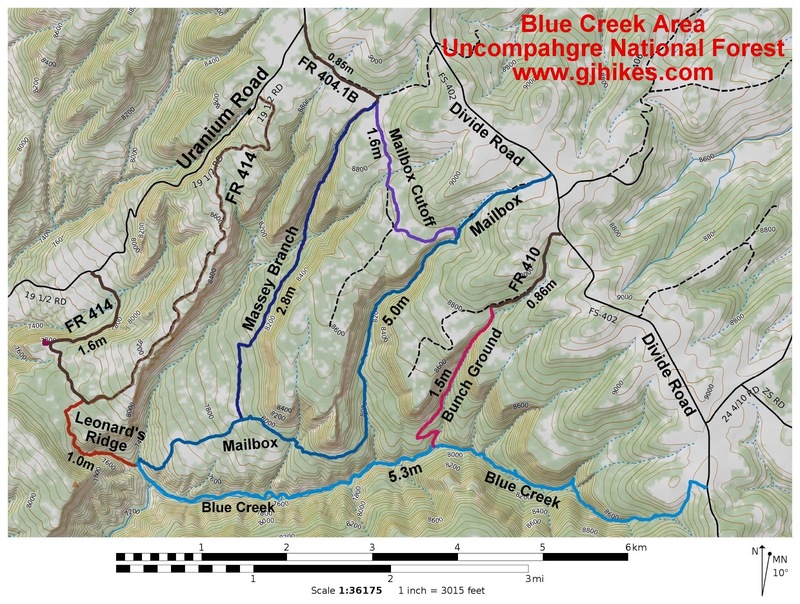 The Blue Creek and Leonard's Ridge trails also meet their ends at the same spot. If you happen to be backpacking or just want to camp it would be best to pick a spot other than the clearing around the junction to avoid ruining the experience for others. There are a couple of other good spots a short distance away that offer some seclusion. This is a look at the hill the last quarter mile of the Mailbox trail descends. It is a little rocky but the ground under it is pretty firm and the steepest section only lasts a couple hundred yards. The Mailbox trail probably gets most of its use from dirt bikers. A popular loop to ride is made by combining the Mailbox, Massey Branch and Mailbox Cutoff trails together. For those that are looking for a nice forest hike or ATV outing the Mailbox trail is worth checking out. If you would like to see it for yourself then all you have to do is 'Take a hike'.